Nurse is guest of honour at launch of flagship £3.5m affordable homes scheme | News by Wales Express News, People Before Profit! An A&E nurse and an injured ex-soldier were the guests of honour at the official launch of a £3.5 million development of 28 affordable homes. New Cartrefi Conwy housing development, Maes Glanarfon, Penmaenmawr Road, official opening by Carl Sargeant Cabinet Secretary for Communities and Children. Pictured are pupils from Ysgol Pant-Y -Rhedyn singing. Jane Jones and William Legge were at the flagship Maes Glanarfon scheme in Llanfairfechan with Carl Sargeant AM, the Welsh Government Cabinet Secretary for Communities and Children, who cut the ribbon to declare it open. They were joined by a host of other dignitaries and were entertained by choirs from local schools Ysgol Pont y Rhedyn and Ysgol Babanod. The development by the Cartrefi Conwy housing association, which supported 205 construction jobs including four apprenticeships, was completed three months ahead of schedule and provided a major boost for the local economy. One of the apprentices, Josh Jones, now lives in one of the properties with his partner and his mum lives next door. The site includes 28 affordable homes, comprising houses and apartments, built around a landscaped cul-de-sac in Penmaenmawr Road. It’s part of Cartrefi Conwy’s £20 million plans to build more than 200 new homes across North Wales. Five of the properties are available at an intermediate rent level which means rents are typically 20 per cent cheaper than the current market rent for similar properties. The intermediate rent properties are aimed at working people in the area with a household income of between £15,000 and £30,000 who do not qualify for traditional social housing but struggle to be able to buy or rent in the private sector. Among the key workers who’ve moved in is nurse Jane Jones, 46, who works at Ysbyty Gwynedd in Bangor. She said: “I have lived in Llanfairfechan all my life. I live with my son, Jack, who is 18. I wasn’t in a position financially to be able to buy my own home or afford commercial rental rates. Former soldier, William Legge, 45, who served with the Royal Engineers for six years, suffered a broken back, two compressed vertebrae and prolapsed disc in an accident in Germany. He said: “I actually remained in the army and made a full recovery but then, in 2001 after I’d left the army, I contracted a disorder called Chronic Inflammatory Demyelinating Polyneuropathy – which basically means my immune system is constantly attacking my nervous system. “I now have difficulty walking, suffer from general weakness and I am in constant pain. According to Gwynne Jones, Cartrefi Conwy’s Managing Director, the new homes have blended seamlessly with the existing Llanfairfechan community. Communities and Children Secretary Carl Sargeant said: “It has been a pleasure to visit Maes Glanarfon and to officially open the development. Cartrefi Conwy is playing an important part in helping us to achieve our ambition to provide 20,000 affordable homes during this term of government. David Kelsall, Cartrefi Conwy’s Development and New Business Manager said: “I’m delighted to have brought forward the Maes Glanarfon development with the support of Conwy County Borough Council and the Welsh Government. “The scheme is part of our ambitious plans for the future and we have secured an additional £5 million from our funders to make our vision become a reality. Conwy-based company Beech Developments worked as principal contractor together with contractor Brenig Construction, from Colwyn Bay, who managed the site and built the properties. Brenig Construction director Mark Parry, a Brenig Construction director, said: “Maes Glanarfon is a fantastic development. I am proud of the added community benefits delivered with the scheme. “As part of our legacy for Llanfairfechan, we have worked closely with Llanfairfechan Library to refurbish and renovate the building. 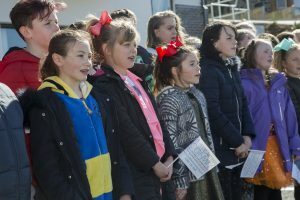 Matthew Jones, the head teacher of both Ysgol Pont y Rhedyn and Ysgol Babanod says pupils really enjoyed singing the traditional Welsh songs at the official opening.